Use the Table editor to edit tables, by adding, changing, or removing columns, keys, indexes, and fact or dimension specific objects. Enter a column's name, data type, length, precision, and other properties in the column's data grid row. 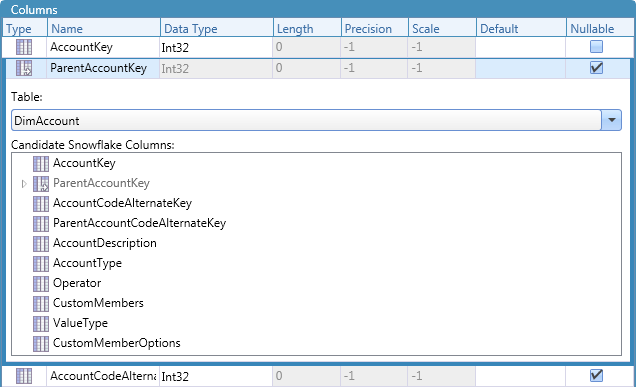 Drag and drop a column to create related keys, indexes, or attributes. Edit a table reference column's table and snowflake columns in its data grid row's details area. Drag and drop a snowflake column to create related keys, indexes, or attributes. Edit a measure's name, SSAS type, measure format, aggregation type, and other properties in its data grid row. Edit a dimension's attributes, hierarchies, and relationships directly in their tree views. Table Column Choose and add table columns to a table. The default is table column. Import Table Assets Display the Import Tables dialog, for importing schemas and tables from a database. Key Choose a key to add to a table. The default is primary key; if a primary key is present, then the default is unique key. Index Add an index to a table. Measure Add a measure to a fact table. Attribute Add an attribute to a dimension. Hierarchy Add a hierarchy to a dimension. Relationship Add a relationship to a dimension. Autogenerate Mesures Add a measure for each table column not already associated with a measure. Apply Measure Formats Choose to preserve or overwrite existing measure formats. Generate Attribute and Relationships Choose to generate attributes, relationships, or both for a dimension.